After the economy tanked, more people started living with family members and — shockingly — roommates. And many of them are totally okay with that. Haya El Nasser and Paul Overberg of USA Today tell the now-common story of a twentysomething — in this case Monika Grundy (not pictured) of Memphis — who moved back in with her parents when she lost her job. Now she's employed again, but she still lives with them, and her parents are totally into it. Says Vel Grundy, her mom, "She has been a really big help and it's nice to have her back." Vel adds that "it's affected her more than me because she's used to being by herself" — but moving back in with parents isn't necessarily a bad thing for offspring either. Jonathan Lewis was in his 40s when he moved in with his mom after losing his job, and he says there was an initial shock: "I came back feeling like a failure." But then things got better. Lewis says, "It kind of was a breath of fresh air," and adds, "It's cool. We have breakfast together. … I take her shopping." El Nasser and Overberg write that "from 2005 to 2009, family households added about 3.8 million extended family members, from adult siblings and in-laws to cousins and nephews." Among all those millions, there must be plenty of extended families whose lives under one roof are pleasant and drama-free. Also on the upswing are non-family roommates — roommate households grew faster than family ones between 2005 and 2009. Certainly there is a sad side to this data — people clearly can't afford as much personal space as they once could. On the other hand, most Americans already have way more personal space than other people on the planet, and the model where everyone lives alone until marriage and kids probably isn't sustainable environmentally, let alone economically. And this model has been inaccessible for many working-class people since long before the recession anyway. 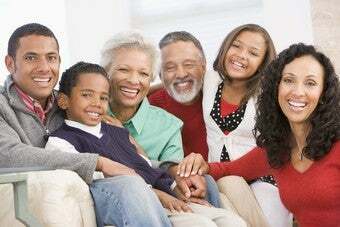 Clearly, living with other people — be they family are not — is not only a workable response to straitened financial circumstances, but actually a beneficial situation for some people. It won't work for everyone — those who don't have positive relationships with their parents probably don't see moving back in with mom and dad is a good option. But it's time to stop treating kids who move back in like they've failed, and parents who accept them like they're overindulgent. And we should stop acting like today's twentysomethings are immature because they don't all have apartments to themselves.